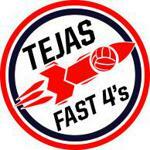 THE "ORIGINAL" FAST FOURS VOLLEYBALL IS BACK! Fast Fours is a combination of volleyball, music, and fun!! Fast Fours is a fast-paced 4-on-4 volleyball event. Every player will love the atmosphere and the excitement. Players can come as individuals or can come together as a team. Those players that register as individuals will be grouped into teams at the night of the event.